This week I made my annual road trip to the Stratford Festival with a few of my girlfriends. On the way there, we noticed a church hosting a "Baking and Plant Sale" in nearby Shakespeare (yes, that's the actual name of the town). As we drove by, I saw big bunches of rhubarb for sale on a table in the parking lot. We talked about pulling over to buy some, but realized that leaving the rhubarb in a warm car for the day wouldn't do it any favours. So we decided to wait and see if there was any still for sale when we drove home. After strolling the streets of Stratford, having lunch, and seeing The Physicists, we drove back through Shakespeare. The table had moved inside the church. While there were still plants and baking available, the rhubarb was all gone. Seeing my disappointed face, the woman behind the table said, "We've got loads at home! I can get you some more." I laughed and said it was all right, but she told me she lived only a block away. And before I knew it, she had her husband on the cell phone, asking him to cut some rhubarb and bring it to the church. "I could have asked him to bring what we cut yesterday," she said, "but that wouldn't have been as fresh." That's why I'm posting this delicious rhubarb crisp recipe today. I've put the rhubarb I didn't use in the freezer, and I'll enjoy this dessert again sometime when it's out of season. Preheat oven to 375 degrees. Butter a 2-quart baking dish and set to the side. Measure the rhubarb, apples, orange extract, sugar, and flour into a medium bowl. Toss until combined and pour in the baking dish. Place the brown sugar and orange rind in a separate bowl and combine until the sugar is scented with the orange rind. Add flour, oats, walnuts and spices, and stir to combine. Cut in the butter until the mixture is crumbly. Sprinkle over the fruit mixture and press down gently. Bake at 375 degrees for 45 minutes, until the fruit filling is bubbly. How sweet of her! Your rhubarb crisp looks very delicious, Beth. Beautiful rhubarb, how nice of her to get it for you! And best of all $2.00???? At the farmers market here, they get 3.00 for about 4 stalks or so it seems. We have a good friend, who in exchange for a pie, brings me a bunch. I just made him a rhubarb pie today. I froze the rest for jam, I think! Have a great week!!! I want to live in a town called Shakespeare and dine on rhubarb (apple) crisp all year 'round! :-) This looks scrumptious. What lovely look this Beth! We donr have so much rhubarb here! Only in the south of Chile! 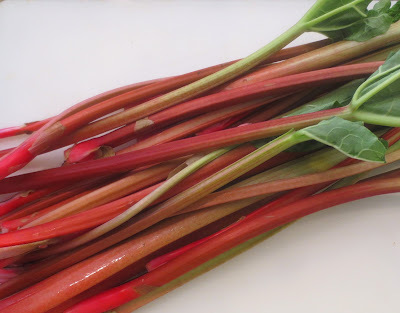 What a fun story of how you got the rhubarb. I'm not sure I've ever eaten it. Maybe it's time to try it. I'm so jealous of your fresh rhubarb!! The kind we've been getting goes bad SO quickly...you have to use it or lose it! This crisp sounds lovely..perfect way to let it shine! My favorite! Really nice of that woman to cut some more for you. I remember my mother's rhubarb patch in the back yard....wish I could have one in Florida! What a lovely story! I just made a strawberry rhubarb pie that will be on my blog on Wednesday! I haven't made an apple crisp in forever! This looks amazing! Crisps are one of my favorite treats and I haven't made one in a long time. Love how you paired rhubarb with apples. Some people from my high school once went to the Stratford Festival. It was a very big deal to them. It sounds like fun. Dear Beth, That is so nice and makes it so much more tasty to know the kindness that was given to you. I'd love to live in a town named Shakespeare! And a big bag of rhubarb for $2?! You scored! Plus your crisp looks wonderful. Thanks! Rhubarb crisp is one of my most favorite desserts, seriously have a love affair with it every spring. :-) Fun story...that all just makes me smile, the random goodness that we find in bits and pieces every day. Beth, rhubarb, one of my favorite spring vegetables and turned into a crisp paired with apples that must be one delectable dessert. © Of Muses and Meringues. All Rights Reserved.